Last December, Nikki Haley, the U.S. ambassador to the United Nations, held a news conference highlighting what she described as proof of Iran’s role in supplying illicit weapons to Yemen’s Houthi rebels. A ballistic missile fired at Riyadh by the Houthis the month before — a failed attempt to hit a major airport there — apparently carried components manufactured by an Iranian firm. This, Haley argued, was “devastating evidence” of Iranian perfidy. Others diplomats weren’t so sure. They suggested the American envoy was overstating the conclusions drawn by U.N. investigators — and possibly seeking to divert attention away from the Trump administration’s controversial moves elsewhere in the Middle East. It’s worth considering Haley’s adamant stance in light of what has happened since. The failed Houthi missile strike caused no casualties, but it prompted Saudi Arabia and its Persian Gulf allies to tighten their blockade on Yemen and intensify the war against the Houthis. Since then, the country’s epochal humanitarian crisis has only worsened, and airstrikes carried out by the Saudi-led coalition have killed dozens of civilians. The most glaring incident happened less than two weeks ago, when a missile struck a bus in northern Yemen. According to local health officials, 54 people were killed, 44 of whom were children traveling on a rare school outing. The BBC’s Orla Guerin, reporting from the scene days later, described the agony of parents finding their dead children among piles of corpses; she spoke to young boys helping dig small graves for their classmates. Meanwhile, Saudi officials said the bus was a “legitimate military target,” pointing to allegations that the Houthis are training child soldiers. The United States, as we’ve detailed in the past, has abetted the Saudi-led war in Yemen, helping refuel aircraft and supplying intelligence and munitions to the coalition. But while Trump administration officials leap to conclusions about the Iranian hand in Yemen’s ruinous war, they are far more coy about their own. 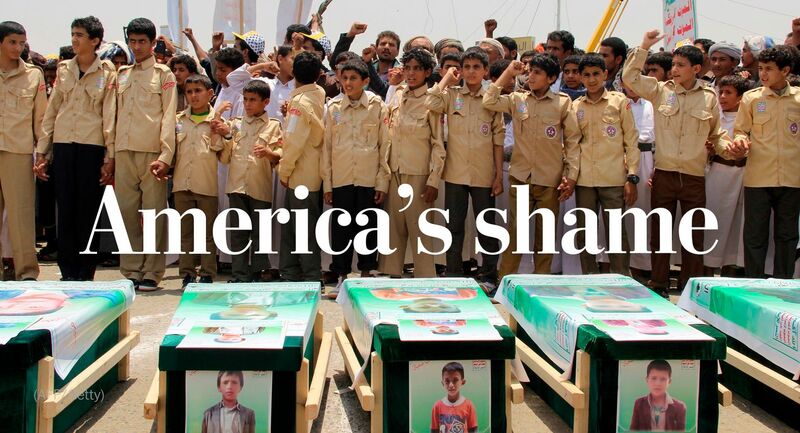 Over the weekend, CNN concluded that it was an American bomb — manufactured by Lockheed Martin, an influential defense contractor — that sent dozens of Yemeni children to their deaths. The report cited munition experts and shrapnel evidence from the scene of the strike. While the Trump administration may wave away its actions in Yemen, there’s a growing uproar in Washington about the horrors of the war. Haley’s performance last year did not silence critics, who are unconvinced by Trump’s arguments about checking Iranian influence. As my colleague Missy Ryan reported, lawmakers in Congress are citing the catalogue of civilian casualties as grounds to establish greater oversight over the war. “I am deeply concerned that continued U.S. refueling, operational support functions and weapons transfers could qualify as aiding and abetting these potential war crimes,” Rep. Ted Lieu (D-Calif.) wrote in a letter to the Pentagon’s inspector general. Sen. Elizabeth Warren (D-Mass.) sought clarification from Gen. Joseph Votel, the head of U.S. Central Command, over how the U.S. military helps support and oversee Saudi and Emirati bombing missions in Yemen. The violence in Yemen — and the mounting evidence of American complicity in atrocities — is fueling a broader conversation about the White House’s ability to wage war. The Trump administration is following the Obama administration’s tacit support of the Saudi-led campaign, but has likely emboldened Riyadh with its vehement grandstanding over Iran and the Houthis. Elsewhere, President Trump has also prioritized strength of arms over diplomacy. In Syria, Trump celebrated his military’s ruthless bombing campaign against the Islamic State, which helped drive out the militants from the city of Raqqa. But now, after laying waste to the city, Trump wants to cut the U.S. funds set aside to help its recovery and reconstruction — a paltry $230 million compared to the $716 billion defense spending bill Trump signed last week. Trump insists that U.S. allies, including the Saudis, can foot the bill to clean up the mess in Syria. But critics say the White House needs to get tough on its friends in the Gulf rather than simply eyeing their purse strings.